Affordable IMAP Hosting is part of the Reselleris commitment to ensuring that everyone has the opportunity to host their own fully-featured web site. Reselleris.com offers a wide selection of other free software installations to help establish your site, that can also be installed in just a few clicks from Softaculous in your web site's cPanel. Reselleris offers the best of IMAP Email tools and options, saving you time and money! How Is Reselleris.com So Affordable & Able To Offer IMAP Email Hosting At Such Low Prices? Cheap IMAP hosting packages are made possible by the use of the latest technology and extremely efficient systems in place here at Reselleris. We believe these savings in costs should be passed on to you the customer, and the result is low cost IMAP Email Hosting with the highest reliability and ease of use. Internet Message Access Protocol (IMAP) enables you to collect email messages from your Reselleris Hosting account using your favorite desktop email software such as Outlook, Outlook Express, Thunderbird and Eudora. IMAP is easy to configure and works by downloading your account's email from the server to your desktop email software. IMAP is a time saving solution, you will not have to log into your Reselleris Hosting Account every time you need to access your email. The advantage of IMAP mail is that the email remains on the server even after it has been downloaded. This is why IMAP is intended for email accounts accessed by more than one user or from multiple computers. Being designed to store messages also makes IMAP a great solution for backing up your email messages. The downside is that the stored email messages can take up a lot of space on your Reselleris hosting account and so needs to be carefully monitored. A POP3 email configuration is a much better solution for email accounts that will only be accessed by one user or if you are concerned about disk space usage. And the best part? Through your Reselleris Hosting Plan, IMAP Email Hosting is available, completely free! Why Should You Choose Reselleris For Your IMAP Hosting? 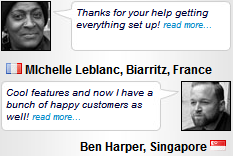 Reselleris has great experience in providing excellent IMAP Email support for our many happy customers. Whatever your budget, IMAP Hosting with Reselleris means reliable hosting. IMAP hosting with Reselleris.com also means easy hosting. With our incredibly wide selection of easily installed scripts from Softaculous and IMAP Email configuration options in the Control Panel, there really could not be an easier and more affordable way to get your IMAP Email Hosting up and running for you. Reselleris has provided tens of thousands of satisfied customers over the years with the most reliable and affordable of IMAP Hosting Solutions. Reselleris understand that you need high levels of reliable and competent support to get the most out of your IMAP Email Hosting and we are naturally proud to be considered one of the top rated Low Cost IMAP Hosting companies. You will enjoy the full support of the experienced Reselleris team, 24 hours a day, 7 days a week. Affordable Budget prices, full features, 99.9% Uptime Guarantee, No Risk Money-Back Guarantee - come and see for yourself why everyone is recommending Reselleris for IMAP Email Hosting!